When I said in my last entry that I was about halfway through the mystery shawl, I made a mistake. I'm now more than halfway through but have another forty rows to do of the last clue to the pattern and then a few rows of edging. It's difficult to see here as the stitches are crowded on the cable of the needle, but there are sprays, almost like wattle fanning out, first one way then the other. It also would show more when blocked. The TV remote is serving as an anchor for the fabric. 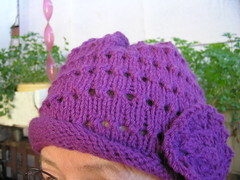 It's taking longer to do the rows as the increases are regular, two per pattern repeat, so twelve in each increase row. I think I've also mentioned how sore my hip has been with a flare of arthritis and that I've had ongoing unpleasantness from a cold of a few weeks ago. I hate the arthritis medications but realised I could not go on as I was last Saturday. I made an appointment for Wednesday. He was not impressed with my tale of woes and spent some time taking my history of sinus problems which I've had almost all my life. I've had many treatments and several operations for it since I was three. He sent me for an x-ray of the sinuses to see what the current state of affairs was. I was given a corticosteroid nose spray sample which has been amazing from the first use. It started to relieve swelling almost as I used it. However, my son who is also currently using this sort of thing warned me to have soemthing to eat before use as the fumes made his stomach upset. Antibiotics as well. On an empty stomach. Then we took on the hip. As I thought, the big guns were called into action. Two doses per day of Voltaren at the heaviest dose I have ever been on. Three doses daily of two Panadol Osteo, two tablets each time. These have to be spaced around the Voltaren which is basically morning and evening. Both these are renowned for causing upset stomach unless taken with food. I seem to be doing nothing but eat and take tablets. Milk is not enough and I have to eat and then take the tablet. This morning I took tablet and then immediately had breakfast. I won't do that again. I've been queasy with a sore stomach all day. Food first then tablet. The x-ray was interesting. I rang to make an appointment but for ordinary x-rays, one just turns up. I was in and out in 20 minutes which I thought was pretty good. I had to twist into odd some positions. The worst had my head tilted up while I leant against the plate of the machine. However head was also twised violently so I was almost looking backward. Very uncomfortable and I was glad when it was over. I'll see him on Monday about the results. Good service from the radiography department and good service from the NSW Electoral Commission. We have municipal council elections here on September 8th. Few seem to know about these and there is very little publicity or advertising around here. I looked up polling booths and found I would have to go the the one I've used ever since I first moved into this district many years ago. Now that would be at least 30 minutes walk, probably more with a bad hip and I doubt I could do both ways. No public transport. I found an application for a postal vote from a candidate in my letter box, so decided to go that way. Filled it out, then discovered I had used the last stamp in my book of stamps so I could not return it from a local post box. Service station does not sell them (or bus tickets) either. Then I found it could be faxed to them provided details were clear. I have no fax and there's no one local. I took a photo of it and attached it in an email. Within half an hour I had an email back saying it was received and accepted and a postal ballot sheet was on its way to me. Who's ever heard of a government department replying as quickly as that and telling me what they were doing. It wasn't just an acknowledgement of the original email from me. I was pleased and surprised. Oh dear - you are in the wars, aren't you? I hope you are soon feeling a lot better. 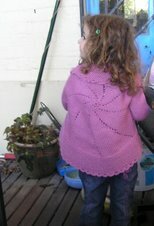 The knitting looks good but it's hard to tell the full beauty of lace until it's been blocked! I have been invited to attend a women's conference that weekend - I hope it's not too late to postal vote. There has been very little advertising around here either and, since we take junk mail from the mailbox to the bin, we may have missed something vital. Unless it came, as it should, in an envelope! Can relate to sinus issue haven't knitted since I got back from my trip due to a sinus headache, nothing really working,didn't know you could get a steroid spray for the inflammation, would be last resort type thing I suppose. Should have realised it was on it's way have had aching teeth for over a week. Excellent news about the spray for your sinus and I hope the other drugs are working too. It must be an endless round of eating and taking tablets, or vice versa. How nice that the Council was helpful, most unlike Councils everywhere! !